New Feature. Auto PeakTrace 6 can be used as a command line program. Improvements to fuse basecall and fuse trace with difficult sequences. Improvement of the basecalling of “drop out” peaks. Improvements to extra normalization of PCR product traces. The major change of this release is that Auto PeakTrace 6 can now be used from the command line. 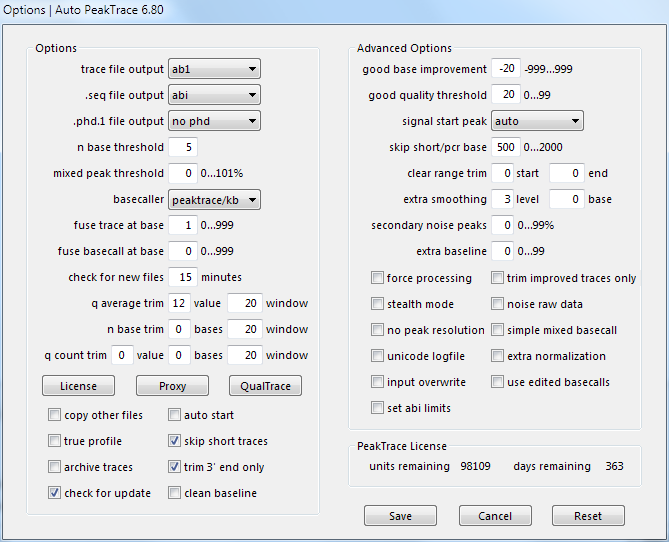 This allows the easy integration of Auto PeakTrace 6 into various LIMS scripts. The use of Auto PeakTrace over the standalone command line peaktrace.exe program makes it possible to set the input to be a directory rather than individual .ab1 files, as well as take advantage of multi-core systems making data processing up to 24x faster. If Auto PeakTrace 6 is used from the command line with no options it will use the settings (including the input and output directories) saved from the last use of Auto PeakTrace 6. The saved settings can be overwritten by the use of command line switches. If no switch value is provided for a setting then value in the save setting file will be used. Settings that are changed via the command line update the setting file for future runs of Auto PeakTrace 6. This update is a recommended update for all users of the PeakTrace:Box System. For user of Auto PeakTrace RP an update will be released shortly.